The college baseball season continues to gain momentum as well swing into week four. This week’s Notebook combines some of the observations of College Baseball 360 Editor Sean Stires with the observations and insights of CB360 contributor Jack Blanchat. Blanchat has been on-hand for three of the marquee early season series around the country this season-Stanford-Rice, Stanford-Vanderbilt and Stanford-Texas. Bryan Peters had both of Nebraska's game-winning hits over UCLA. weekend in Lincoln. All three games went to extra innings. How rare is that? Nebraska has been playing baseball since 1889, but prior to Friday and Saturday it had never had extra inning games in back-to-back days go to extra frames. Gerrit Cole lost a perfect game after retiring Nebraska’s first 20 batters Friday, but still helped the Bruins win 1-0 in 11 innings thanks to nine shutout innings. With Trevor Bauer on the mound, Nebraska’s hopes for a win weren’t looking any better on Saturday. Bauer fanned 17 in 10 innings, but settled for a 129 pitch no-decision in the Cornhusker’s 2-1 win. 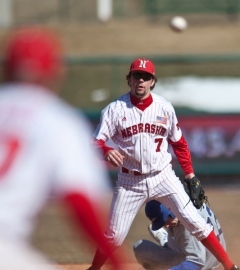 Bryan Peters had the game-winning hit in the bottom of the 12th for Nebraska, while Dylan Vogt pitched five no-hit innings of relief to earn the win. The Cornhuskers then plated three runs in the bottom of the 9th inning in Sunday’s series finale and eventually won 5-4 in 11 innings. Peters was the hero again, belting a game-ending home run to give Nebraska back-to-back walk-off wins for the first time in eight years. Nebraska is 8-4 with a team batting average of .303. UCLA is 7-4, despite a 1.55 team ERA with 126 strikeouts and 42 walks in 104 1/3 IP. Florida (10-1) suffered its first loss of the season to Florida State in the Florida Four event last week, but the Gators came back strong over the weekend with a three-game sweep of Miami in Gainesville. Florida’s starting rotation of Brian Johnson, Hudson Randall and Karsten Whitson combined to allow just two earned runs in 17.0 innings during the series. It’s just the second time in school history that Florida has swept a three-game set from the Hurricanes. Don’t look now, but Cal State Bakersfield is on a run. The Roadrunners have won 10 straight with the help of some great pitching. Bakersfield, playing its first games away from home this season, gave up just two runs while going 4-0 at the Coca Cola Classic over the weekend in Surprise, AZ. The biggest of the wins was a 2-1 10-inning victory over Arizona State. Freshman Cael Brockmeyer’s 10th inning home run off ASU All-American Mitchell Lambson was the difference. The Roadrunners also turned-in wins over Kansas (12-0), Air Force (5-0) and Northern Illinois (6-1). Bakersfield starting pitchers Tommy Hoenshell, Mike McCarthy, Jonathon Montoya, and Brandon Van Dam combined to pitch 35 innings, while giving-up just two runs. McCarthy was the only one not to pitch 9.0 innings. Indiana State’s Jason Van Skike tossed a no-hitter in Saturday’s 8-0 win over Central Arkansas. It’s the school’s 10th all-time no-hitter, but the first nine inning no-no for a Sycamore since 1943. Van Skike needed 143 pitches to complete the gem, which still had its share of base runners. Van Skike struckout five, but he walked eight batters and hit one more. When talking about TCU pitchers, 2010 freshman phenom Matt Purke is typically the first name to come to mind. However, Kyle Winkler has been lights out so far this year for the Horned Frogs. Winkler (3-0) has allowed just two unearned runs in 22 1/3 IP so far this season. 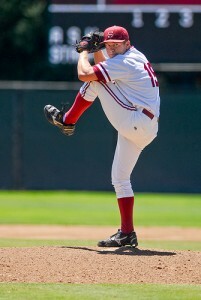 The senior has 19 strikeouts and just one walk with a .149 opponent batting average. He moved to the Friday spot in the rotation the last two weeks while Purke battled a blister on his pitching hand. Purke has pitched 10.0 shutout innings himself this season (he pitched against Kansas on opening weekend and pitched Sunday against Texas Tech) to improve to 2-0 this year and 18-0 in his career. Meanwhile, freshman Andrew Mitchell has surrendered just a run in his first 15 2/3 IP, including a Sunday start against Cal State Fullerton last week when Purke missed his start. The Horned Frogs’ bullpen is still a work in progress though. TCU’s opponents have scored winning runs in the 8th inning or later in all four of the team’s losses this year. Arkansas senior Kyle Robinson played sparingly in his first year at Arkansas last year after transferring from Indian River CC. Injuries played a part in his limited time, but Robinson is making-up for it this year. He hit .474 (9-for-19) with three home runs and 13 RBIs last week. 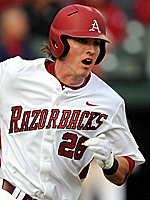 The outfielder’s .465 batting average is the third best in the SEC through the first three weeks of 2011. He also ranks in the top five in the conference in slugging percentage (#3 – .791), runs (#5 – 14), hits (T-#1 – 20), and RBI (#1 – 21). Notre Dame is just 4-6 through Mik Aoki’s first ten games at the helm, but it’s not for a lack of pitching. Starting pitchers Brian Dupra, Cole Johnson and Todd Miller combined to give the Irish nine straight quality starts (at least 6.0 IP and 3 ER or less) to open the season. The last time a Notre Dame staff had just six straight quality starts was 2001, when 2000 and 2001 first round draft pick Aaron Heilman helped the program achieve its first ever #1 national ranking. Dupra, Johnson and Miller combined for 22 2/3 IP with 21 strikeouts and no walks in their three starts last weekend, but went 0-2 with a no-decision (the Irish beat Manhattan in extra innings in Miller’s start). James Madison is off to a record-setting start in 2011. The Duke’s 11-1 start is the best in program history. JMU leads the nation with 30 home runs and 13.3 runs-a-game through the season’s first three weeks. Now we’ll turn things over to Jack Blanchat, who was at the Stanford vs. Texas series in Austin. The Longhorns took two out of three games in the series. Blanchat’s insights start with thoughts on Texas ace Taylor Jungman, who saw his run of 22.0 scoreless innings to open the season come to a close in Friday’s 4-3 Texas win. Taylor Jungmann is the real deal – it doesn’t get much simpler than that. 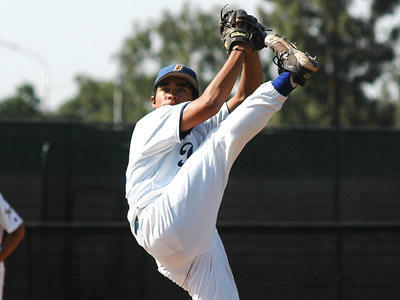 He’s confident, aggressive, and he mixes up his pitches and gets outs in every way. His odd delivery makes it hard to pick up the baseball coming out of his hand, and he gets results. It shows something that Friday night was his worst outing of the season so far, considering he pitched eight and two-thirds innings and only gave up three runs on six hits. Even more impressive about those six hits was that nobody got multiple hits off Jungmann – and nothing was hit particularly hard other than a triple from Brian Ragira that broke up Jungmann’s perfect game in the fifth inning. The environment at Disch-Falk Field was like an NCAA super regional – absolutely crazy, and jam-packed. It’s one of the biggest stadiums in college baseball in terms of capacity and playing dimensions. The stadium also has field turf instead of a natural grass playing surface, so that made conditions a little harder because the baseball would occasionally act very strangely after it bounced off the turf. The playing conditions, which included wind coming in from left field most of the time, resulted in no home runs for a Stanford team that had six dingers in eight games coming into this series, but it also contributed to the three triples in the series as well. Texas trotted out a few new faces in their lineup, and they all had a few bright spots, but they still looked very much like freshmen. Jacob Felts did a nice job behind the plate, catching Jungmann’s Friday win(although, the way Jungmann is pitching, it’s hard not to do a good job behind the plate), and he went 2-for-7 and scored a run offensively – altogether not a bad weekend for a freshman catcher. Freshman rightfielder Mark Payton went just 1-for-10 at the plate, but he still scored a run and had two RBI in the series thanks to some erratic Stanford pitching. Finally, freshman third baseman Erich Weiss was solid on offense – he had a hit in every game – but he struggled defensively in Saturday’s contest. He had two errors at the hot corner, and could have been docked for one more if the scorekeeper had been less friendly. Stanford’s pitching rotation is shaping up pretty well – now the offense just has to go out and get Mark Appel a win on Friday night. The sophomore has had tremendous stuff in all three of his starts this season, but by virtue of going up against Sonny Gray and Taylor Jungmann, Appel’s record sits at 0-2 so far. It’s easy to believe that Appel will get back in the win column as the season goes along, but he has shown he can be a primetime player on Friday nights – something the Cardinal will need if they want to overtake UCLA and Gerrit Cole in the Pac-10 down the road. righthanders with great control and a nice array of pitches, even though they don’t have overpowering stuff. I think at this point in the season Stanford head coach Mark Marquess is just trying to mix up his rotation a little bit and see how guys work in different places. Mark Appel brings the power on Friday night and has almost out-dueled both Sonny Gray and Taylor Jungmann. The three week “Country Music Swing” – Houston, Nashville, and Austin – has been tough on the Cardinal’s record, but they have been impressive so far. I get the sense that the team is ready for a few days off, and they’ll get it with finals week this week. In the big picture, Stanford won’t face as consistently good pitchers as they’ve faced these last three weeks, and that should help cut down on strikeouts. 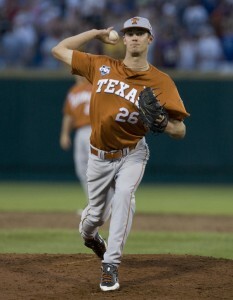 Stanford struck out 27 times in the series against Texas (Jungmann had nine) and therefore stranded 23 runners. All in all, this three-week test has been good for Stanford, though. They’ll be ready to take on teams in a deep Pac-10 Conference, and they’ll have just as much or more experience against the nation’s top teams when it comes time for the NCAA Tournament. Dugouthats.com has officially licensed 2010 College World Series memorabilia year round! From t-shirts and caps to limited edition prints commemorating the last CWS ever played at historic Rosenblatt Stadium. Dugouthats.com also always hats of your favorite college teams like LSU, Texas, Cal State Fullerton, Long Beach State, UCLA, South Carolina, Miami and more.